Companies publish works under copy protection because they believe that the cost of implementing the copy protection will be less than the revenue produced by consumers who buy the product instead of acquiring it through casually copied media. When computer software was still distributed in audio cassettes, audio copying was unreliable, while digital copying was time consuming. Software prices were comparable with audio cassette price. To make digital copying more difficult, many programs used non-standard loading methods (loaders incompatible with standard BASIC loaders, or loaders that used different transfer speed. For some time, Locksmith continued to defeat virtually all of the copy protection systems in existence. The next advance came from Henry Roberts' thesis on software copy protection, which devised a way of replacing Apple’s sync field of FFs with random appearing patterns of bytes. Because the graduate student had frequent copy protection discussions with Apple’s copy protection engineer, Apple developed a copy protection system which made use of this technique. Henry Roberts then wrote a competitive program to Locksmith, Back It UP. He devised several methods for defeating that, and ultimately a method was devised for reading self sync fields directly, regardless of what nibbles they contained. The back and forth struggle between copy protection engineers and nibble copiers continued until the Apple II became obsolete and was replaced by the IBM PC and its clones. In 1989 Gilman Louie, head of Spectrum Holobyte, stated that copy protection added about $0.50 per copy to the cost of production of a game. For software publishers, a less expensive method of copy protection is to write the software so that it requires some evidence from the user that they have actually purchased the software, usually by asking a question that only a user with a software manual could answer (for example, "What is the 4th word on the 6th line of page 37?"). This approach can be defeated by users who have the patience to copy the manual with a photocopier, and it also suffers from cracked product becoming more convenient than original. During the 1980s and 1990s, video games sold on audio cassette and floppy disks were sometimes protected with an external user-interactive method that demanded the user to have the original package or a part of it, usually the manual. Copy protection was activated not at installation but every time the game was executed. The most common method ("What is the 13th word on the 7th line of page 22?") was often used at the beginning of each game session, but as it proved to be troublesome and tiring for the players, it declined in popularity (for example, X-COM: UFO Defense used it too, but was later removed by the official v1.4 patch). A variant of this technique involved matching a picture provided by the game to one in the manual and providing an answer pertaining to the picture (Ski or Die, 4D Boxing and James Bond 007; the Stealth Affair used this technique). Buzz Aldrin's Race Into Space (in the floppy version but not the CD version) incorporated a copy protection scheme that required the user to input an astronaut's total duration in space (available in the manual) before the launch of certain missions. If the answer was incorrect, the mission would suffer a catastrophic failure. Some sort of code with symbols, not existing on the keyboard or the ASCII code. This code was arranged in a grid, and had to be entered via a virtual keyboard at the request "What is the code at line 3 row 2?". These tables were printed on dark paper (Maniac Mansion, Uplink), or were visible only through a red transparent layer (Indiana Jones and the Last Crusade), making the paper very difficult to photocopy. Another variant of this method—most famously used on the ZX Spectrum version of Jet Set Willy—was a card with color sequences at each grid reference that had to be entered before starting the game. This also prevented monochrome photocopying. The codes in tables are based on a mathematic formula and can be calculated by using the row, line and page number if the formula is known, since the data would have required too much disk space. The Secret of Monkey Island offered one of the most imaginative protection keys: a rotating wheel with halves of pirate's faces. The game showed a face composed of two different parts and asked when this pirate was hanged on a certain island. The player then had to match the faces on the wheel, and enter the year number that appeared on the island-respective hole. Its sequel had the same concept, but with magic potion ingredients. Other games that employed the code wheel system include games from Accolade like Star Control. Zork games such as Beyond Zork and Zork Zero came with "feelies" which contained information vital to the completion of the game. For example, the parchment found from Zork Zero contained clues vital to solving the final puzzle. However, whenever the player attempts to read the parchment, they are referred to the game package. The in-game help function alluded to this form of control with the response "Good luck, Blackbeard" to queries that were unsolvable without the original game materials. The PlayStation 3, Xbox One, and PlayStation 4 use Blu-ray BD-ROM discs. In addition to any protection provided by the consoles themselves, the BD-ROM format's specification allows for a ROM-Mark which cannot be duplicated by consumer-level recorders. The BD-ROM format, in addition, provides considerable capacity: up to 100 gigabytes per disc with potential revision to provide more (many BD-ROM games use 40-50 gigabytes), making it unwieldy for online file-sharing, a major method of video game copying. To prevent the consoles themselves being hacked and used as a means to defeat these protections (as happened with the Wii and partially with the PlayStation 3), contemporary consoles employ trusted hardware paths that authenticate the internal hardware and software prior to operation. Starting in 1985 with the video release of "The Cotton Club", Macrovision has licensed to publishers a technology that exploits the automatic gain control feature of VCRs by adding pulses to the vertical blanking sync signal. These pulses do not affect the image a consumer sees on his TV, but do confuse the recording-level circuitry of consumer VCRs. This technology, which is aided by U.S. legislation mandating the presence of automatic gain-control circuitry in VCRs, is said to "plug the analog hole" and make VCR-to-VCR copies impossible, although an inexpensive circuit is widely available that will defeat the protection by removing the pulses. Macrovision has patented methods of defeating copy prevention, giving it a more straightforward basis to shut down manufacture of any device that descrambles it than often exists in the DRM world. More recently, publishers of music and films in digital form have turned to encryption to make copying more difficult. CSS, which is used on DVDs, is a famous example of this. It is a form of copy protection that uses 40-bit encryption. Copies will not be playable since they will be missing the key, which is not writable on regular DVD-R or DVD-RW discs (except with special Qflix DVD-recorders and media). With this technique, the work is encrypted using a key only included in the firmware of "authorized" players, which allow only "legitimate" uses of the work (usually restricted forms of playback, but no conversion or modification). The controversial Digital Millennium Copyright Act provides a legal protection for this in the US, that would make it illegal to distribute "unauthorized" players—which was supposed to eliminate the possibility of building a DVD copier. However, encryption schemes designed for mass-market standardized media such as DVD suffer from the fundamental weaknesses that consumers have physical access to the devices containing the keys, and once implemented, the copy-protection scheme can never be changed without breaking the forward compatibility of older devices (or the backward compatibility of newer media). Since consumers are highly unlikely to buy new hardware for the sole purpose of preserving copy protection, manufacturers have been prevented from enhancing their DRM technology until recently, with the release of next-generation media such as HD DVD and Blu-ray Disc. This period represents more than enough time for the encryption scheme to be defeated by determined attackers. For example, the CSS encryption system used on DVD Video was broken within three years of its market release in November 1996 (see DeCSS), but has not been changed since, because doing so would immediately render all DVD players sold prior to the change incapable of reading new DVDs—this would not only provoke a backlash amongst consumers, but also restrict the market that the new DVDs could be sold to. More recent DVDs have attempted to augment CSS with additional protection schemes. Most modern schemes like ARccOS Protection use tricks of the DVD format in an attempt to defeat copying programs, limiting the possible avenues of protection—and making it easier for hackers to learn the innards of the scheme and find ways around it. In Sid Meier's Pirates, if the player entered in the wrong information, s/he could still play the game, but at a level that would be very hard to make it far in the game. Bohemia Interactive Studio developed a unique and very subtle protection system for its game Operation Flashpoint: Cold War Crisis. Dubbed FADE, if it detects an unauthorized copy, it does not inform the player immediately but instead progressively corrupts aspects of the game (such as reducing the weapon accuracy to 0) to the point that it eventually becomes unplayable. The message "Original discs don't FADE" will eventually appear if the game is detected as being an unauthorized copy. FADE is also used in ArmA II. They continued these methods in Take On Helicopters, where the screen would blur and distort when playing a counterfeit copy. More recently, Batman: Arkham Asylum implemented a copy protection system where the game disables Batman's glide system and various other features, rendering the player unable to continue beyond a certain point. The PC version of Grand Theft Auto IV has a copy protection that swings the camera as though the player was drunk. If the player enters a vehicle it will automatically throttle, making it difficult to steer. It also damages the vehicle, making it vulnerable to collisions and bullets. An update to the game prevented unauthorised copies from accessing the in-game Internet browser, making it impossible to finish the game as some missions involve browsing the web for objectives. EarthBound is well-documented for its extensive use of Checksums to ensure that the game is being played on legitimate hardware. If the game detects that it is being played on a European SNES, it refuses to boot, as the first of several checksums has failed. A second checksum will weed out most unauthorized copies of the game, but hacking the data to get past this checksum will trigger a third checksum that makes enemy encounters appear much more often than in an authorized copy, and if the player progresses through the game without giving up (or cracks this protection), a final checksum code will activate before the final boss battle, freezing the game and deleting all the save files. Red Alert 2 has a copy protection system, where if an unlicensed version of it is detected, the player's entire base is destroyed within 30 seconds of the player joining a match. The DS version of Michael Jackson: The Experience has a copy protection system where vuvuzela noises are heard as the music is playing, the notes are invisible, making the game impossible to play, and the game freezes upon the player pausing it. 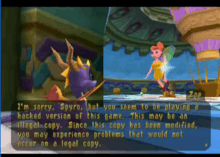 In Spyro: Year of the Dragon a character named Zoe will tell the player outside the room containing the balloon to Midday Garden Home and several other areas that she is using an unlicensed copy. This conversation purposely corrupts data. When corrupted, the game would not only remove stray gems and the ability to progress in certain areas but also make the final boss unbeatable, returning the player to the beginning of the game (and removing the save file at the same time) after about 8 seconds into the battle. An update to the sandbox game Garry's Mod enabled a copy protection mechanism that outputs the error "Unable to shade polygon normals" if the game detects that it has been copied. The error also includes the user's Steam ID as an error ID, meaning that users can be identified by their Steam account when asking for help about the error on the Internet. On a copied version of the original PC version of Postal, as soon as the game was started the player character would immediately shoot himself in the head. An unlicensed version of Serious Sam 3: BFE spawns a large immortal monster early on in the game. In Crytek's "Crysis 3", if a player used an unlicensed copy of the game, he is not able to defeat the last boss (The Alpha Ceph), thus making it impossible to beat the game. In Five Nights at Freddy's, if the game is unauthorized, exiting the game will only take place after the player is subjected to one of the animatronics attacking and killing him, complete with the screeching sounds normally heard when the player is caught. The game plays normally, however. It includes, but is by no means limited to, the combined efforts of corporate associations (such as the RIAA and MPAA), law enforcement agencies (such as the FBI and Interpol), and various international governments to combat copyright infringement relating to various types of creative works, such as software, music and films. These measures often come in the form of copy protection measures such as DRM, or measures implemented through a content protection network, such as Distil Networks or Incapsula. Richard Stallman and the GNU Project have criticized the use of the word "piracy" in these situations, saying that publishers use the word to refer to "copying they don't approve of" and that "they [publishers] imply that it is ethically equivalent to attacking ships on the high seas, kidnapping and murdering the people on them". Certain forms of Anti-Piracy (such as DRM), are considered by consumers to control the use of the products content after sale. In the case MPAA v. Hotfile, a Judge Kathleen M. Williams granted a motion to deny the prosecution the usage of words she views as "pejorative". This list included the word "piracy", the use of which, the motion by the defense stated, would serve no purpose but to misguide and inflame the jury. The plaintiff argued the common use of the terms when referring to copyright infringement should invalidate the motion, but the Judge did not concur. Today copyright infringement is often facilitated by the use of file sharing. In fact, infringement accounts for 23.8% of all internet traffic today. In an effort to cut down on this, both large and small film and music corporations have issued DMCA takedown notices, filed lawsuits, and pressed criminal prosecution of those who host these file sharing services. MPAA encryption of DVD movies using the CSS cipher and prohibiting the distribution and use of DeCSS, while also having the effect of banning free/open source DVD player software. "Coded Anti-Piracy", also called CAP codes, as a way to put a forensic identification on the film to trace back illegal copies of films to the source. Metal Gear Solid and many other computer games require a piece of information from the game's jewel case for the player to progress after a certain point, making unauthorized copies effectively worthless without the original jewel case; however in the present day, said information can be easily be found on the Internet. EarthBound (Mother 2) for the SNES, in addition to showing warning screens and drastically increasing the number of enemies, deliberately crashes itself at the final boss fight forcing the player to reset the game; upon attempting to reload the game, the player's saved games are deleted if the copy is detected to be unauthorized. Command and Conquer: Red Alert 2 contained code that detected unauthorized game copies and caused all of the player's buildings and units to explode a few seconds into gameplay, effectively rendering the copy useless. However this also ended up being a double edged sword as some players who legitimately owned a copy of the game reported this happening. Michael Jackson: The Experience for the Nintendo DS makes the game unplayable by making the touchscreen controls non-functional and every song turns into vuvuzela noise. Grand Theft Auto IV has the screen shaken with the "drunken cam" throughout the whole game making it impossible to complete some parts of the game. ARMA 2 uses the FADE technology to detect unauthorized copies. If the check fails, the player's guns will have decreased accuracy and will become progressively worse throughout the game. In addition, a "drunken vision" mode will sometimes activate wherein the screen becomes wavy. ↑ Thomas Obnigene, DVD Glossary, filmfodder.com 2007. Retrieved July 19, 2007. ↑ Confusing Words and Phrases that are Worth Avoiding, GNU Project - Free Software Foundation (FSF). ↑ Wallach, D.S. (Oct 2011). "Copy protection technology is doomed". Computer. 34 (10): 48–49. doi:10.1109/2.955098. Retrieved 2013-02-10. 1 2 Pournelle, Jerry (June 1983). "Zenith Z-100, Epson QX-10, Software Licensing, and the Software Piracy Problem". BYTE. p. 411. Retrieved 20 October 2013. ↑ Curran, Lawrence J.; Shuford, Richard S. (November 1983). "IBM's Estridge". BYTE. pp. 88–97. Retrieved 19 March 2016. ↑ Dominic Haigh (2010-06-28). "Copy protection on virtual systems". Knol.google.com. Retrieved 2010-12-06. ↑ Retro Gamer issue 83, "Don't copy that floppy"
↑ "Please Steal My Game". getminecraftforfree.org. Retrieved 3 August 2013. ↑ Some relevant patents are U.S. Patent 4,631,603; U.S. Patent 4,577,216; U.S. Patent 4,819,098; and U.S. Patent 4,907,093. ↑ One such patent is U.S. Patent 5,625,691. ↑ Sven Liebich, Germany. "Settlers3.com". Settlers3.com. Retrieved 2010-12-06. ↑ "FADE Game Copy Protections". GameBurnWorld. Retrieved 2010-12-06. ↑ "Bohemia Interactive Details Unique Anti-Piracy Methods". GamePolitics. ↑ "Afterdawn.com". Afterdawn.com. 2009-09-09. Retrieved 2010-12-06. ↑ "MOTHER 2 / EarthBound Anti-Piracy Measures". Starmen.Net. Retrieved 2010-12-06. ↑ "Beejive IM Moves To Block Out iPhone Pirates". washingtonpost.com. 2009-03-19. Retrieved 2010-12-06. ↑ Dodd, Gavin (2001-10-17). "Keeping the Pirates at Bay: Implementing Crack Protection for Spyro: Year of the Dragon". Gamasutra. Archived from the original on 2010-12-30. Retrieved 2008-03-28. ↑ Walker, John. "Serious Sam's DRM Is A Giant Pink Scorpion". Rock, Paper, Shotgun. ↑ Patrick (April 29, 2013). "What happens when pirates play a game development simulator and then go bankrupt because of piracy?". ↑ Ernesto (April 29, 2013). "Game Pirates Whine About Piracy in Game Dev Simulator". TorrentFreak. ↑ Boorstin, Julia (January 31, 2011). "Piracy Rules the Web, Dominating 23.8% of Internet Traffic". CNBC Media Money. Retrieved 28 May 2013. ↑ Masnick, Mike (May 29, 2012). "Fox Issues DMCA Takedown To Google Over SF Chronicle Article... Claiming It Was The Movie 'Chronicle'". Techdirt. Retrieved 28 May 2013. ↑ Menta, Rich. "RIAA Sues Music Startup Napster for $20 Billion". MP3Newswire. Retrieved 28 May 2013. ↑ enigmax (April 17, 2009). "The Pirate Bay Trial: The Official Verdict – Guilty". TorrentFreak. Retrieved 28 May 2013. ↑ Boorstin, julia (2013-02-06). "The Weakest Link". The Hindu. Chennai, India.